There's nothing more classy than an elegantly styled, high quality, handcrafted Hoosier Heritage bookcase in your living room, office, or suite. Available in three different sizes, four different wood types, and dozens of stain colors makes certain you will find the perfect bookcase for your room. Add even more elegance to this piece by adding glass doors with mullion to the Hoosier Heritage. The 5 foot Hoosier Heritage 3 Shelf Bookcase is a perfect addition to any room as a stand alone piece or with any of our other Hoosier Heritage pieces. Four shelves give this bookcase the versatility and capacity to take on a sizable collection of books. This Hoosier Heritage Bookcase can be built from four different wood types, each of which can have several stain colors applied for that truly custom look. Also add the elegance of glass mullion doors to keep dust away from you books and for that more sophisticated look. The Kensing bookcase is pictured built in brown maple with Michaels Cherry Stain with burnished arches and corners. Burnishing adds some darker stain to edges to make the piece look aged. Custom finishes such as burnishing need to be ordered by phone. 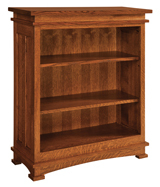 The shorter Kenwood Bookcase is solid wood to support as many books and treasures as you can put on it. This bookcase has long vertical side panels and is a classic. Classically styled, the taller Kenwood Bookcase has vertical side panels, and panel doors under three shelves. This bookcase features heirloom quality construction because solid wood never goes out of style. The Keystone Bookcase pictured above is built in qs white oak with Michael's Cherry stain. The smaller Kincade Bookcase has a round over edge at the top and crown molding beneath. Full length side panels lead down to more molding and a solid bottom. This bookcase is solid wood. The full sized Kincade Bookcase has five ample shelves and hardwood construction to keep your collection of books safe for generations of use. Two side panels running the length of the bookcase complement luxurious molding above and below, and a dignified solid base. The pictured Kincaid Bookcase is built in brown maple with FC-17182 Vintage Antique stain. The pictured Kincaid Open Bookcase is built in brown maple with FC-17182 Vintage Antique stain. Pictured in red oak with CFS-12 Dark Walnut finish. This solid oak bookcase offers both a beautiful way to organize your books and collections. The glass doors open outward for easy access to your belongings. Both larger and smaller versions of this style bookcase are available through Amish Furniture Factory. Pictured in sap cherry with Earthtone stain. Practical and sophisticated, the Lincoln bookcase can hold even the quickest growing libraries. The bookcase has six wooden shelves and a back that will not warp or break from heavy books and collections. The elegant Lincoln family of products is splendid and built to last for decades. The solid wood construction also means these pieces can be stained to a variety of shades through the Amish Furniture Factory. 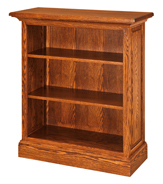 The Modesto Bookcase pictured above is built in qs oak with Michael's Cherry stain. You can pick 43" wide or 55" wide on each style. The Manitoba Bookcase pictured above is built in brown maple with Rich Tobacco OCS-228 stain. You can pick 39" wide or 48" wide on each style.